My grandparents arrived at Ellis Island on January 1, 1923. They'd both been in their early 20s when they'd fled Minsk, Russia. If you were Jewish, living in Russia at the turn of the 20th century was very hard. Pogroms and state-sponsored anti-Semitism made life dangerous. My grandparents had seen that there was no future in the old country. And when they arrived, they found a small apartment in Brooklyn, New York. Soon after, my grandfather found work as a tailor. 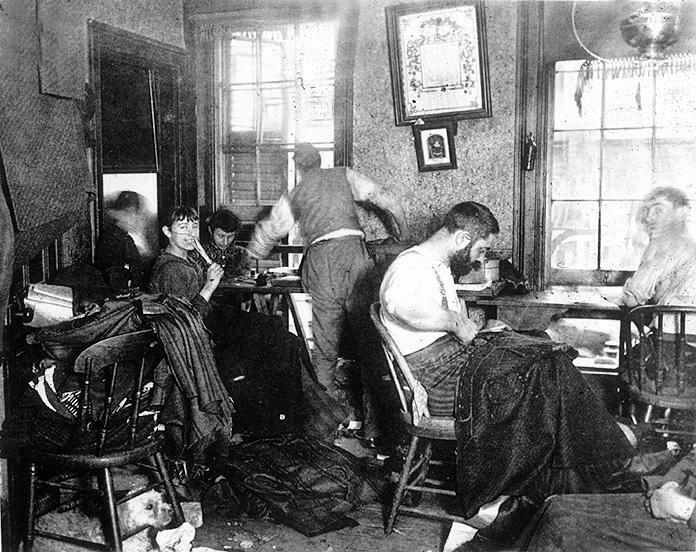 He later found better pay by working in New York’s garment center. He became a milliner, a maker of women’s hats. But life still wasn’t easy, especially during the Great Depression. They fell behind on their rent and were about to be evicted. But my grandmother cut a deal with the landlord. For a small reduction in the rent, she would mop the hallways and throw out the garbage. Once a week, she would also scrub the concrete stairs in front of the building. My grandfather worked 12-hour days for most of his life. And he never made more than a union scale salary. Each week, he'd give my grandmother his paycheck. And she would pay all the bills and give him a small allowance. My grandfather passed away in 1982. But my grandmother didn’t need to be worried about the future. My grandfather had been putting a small amount of money away each week, which had produced a large nest egg. He left behind more than $265,000 in today’s dollars. This money provided for my grandmother. And when she passed away 13 years later, she left behind a nice inheritance for her family. My grandmother never learned how to read or write in English. But she did know how to manage money. She'd never read a book about investing and wasn’t able to read the financial section of the newspaper. But she'd stumbled upon the secret that changed everything. Her portfolio had been made up of safe stocks that paid dividends. Many public companies pay out cash to their shareholders. That cash is known as dividends. And companies pay them out quarterly to shareholders. A dividend is management’s way of sending a strong message to shareholders. Dividends also attract patient holders of the stock, too. It also keeps management’s eye on cash flow. Once it commits to paying dividends, management has to ensure that its business is producing a steady stream of reliable earnings. 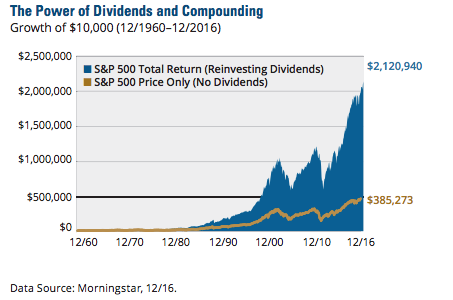 The impact of dividends on the total return of the S&P 500 index is huge. Over the past 50 years, if an investor only held the S&P 500 and didn't reinvest their dividends, a $10,000 investment would be worth $385,273 today. The best way to reinvest dividends is to invest in stocks that offer dividend reinvestment plans (DRIPs). DRIPs allow investors to reinvest their cash dividends into additional shares. Instead of receiving the dividend as a check or direct deposit, many companies offer additional shares to the investor. Some DRIPs give shareholders additional shares without having to pay a commission. Others offer shares through their DRIP at up to a 10% discount off the current share price. Dividend investing is the lazy person’s guide to making money. It requires no effort or decision-making on your part. The key is to find companies that have a history of paying out dividends and have a reliable stream of earnings. One of these companies is York Water Company, which has been paying out dividends since 1815. That's for more than 200 years! Procter & Gamble provides branded consumer packaged goods to consumers in the U.S., Canada, Puerto Rico, Europe, Asia-Pacific, China, Latin America, India, the Middle East, and Africa. Together with its subsidiaries, Johnson & Johnson researches and develops, manufactures, and sells various products in the health-care field worldwide. Sanofi is a leading global health-care company that's focused on patient needs and engaged in the research, development, manufacture, and marketing of therapeutic solutions. UPS was founded in 1907 as a private messenger and delivery service in Seattle. Today, it's the world's largest package delivery company, a leader in the U.S. less than truckload (LTL) industry, and a premier provider of global supply-chain-management solutions. The York Water Company is the oldest investor-owned water utility in the U.S. and is duly organized under the laws of the Commonwealth of Pennsylvania. The company has operated continuously since 1816. For those who want an even bigger advantage, I urge you to check out my premium investment portfolio. Inside, you’ll not only find more dividend stocks to add to your portfolio but also all my other investing research, ideas, and stocks. Click here to gain access now.